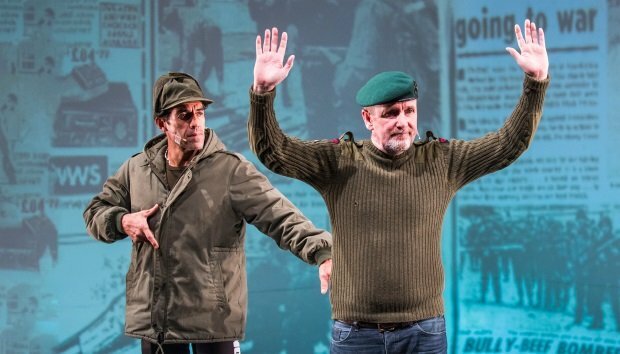 Bringing together six veterans of the Falklands / Malvinas war, Lola Arias' documentary theatre study of the 1982 conflict ranges across the experiences of soldiers on both sides. From a sailor who survived the sinking of the General Belgrano, through a Gurka – and his subsequent world travels – and a triathlon champion who struggled for years with anger, Arias brings their true stories to the stage in a fragmented study of the impact of war on the survivors. Ironically, the documentary format, with its emotional honesty and real-life experiences is theatrically dishonest: following a chronological line, it lurches between ideas and mostly avoids many difficult political questions, only admitting the different histories of Argentina and the UK towards the end, before concluding with a crass rock number that bellows the horror of war at the audience. Yet it rides on the performances and experiences of the remarkable six men who have fought not only the war but also its consequences. The meandering structure, the abrupt shifts in mood and a reluctance to address the wider context of the conflict, beyond caricatures of politicians, prevent Minefield adding much to the story of the war beyond the fascinating biographies of the men. While they deserve an ovation for their bravery in addressing a painful past, the production states little more than war is a bad thing for the soldiers, whether their side won or lost. The Studio, until 9 Aug, 7pm, £18.